Driving through the beautiful Green Mountains and agrarian landscape of Vermont, or experiencing Vermonters’ energetic insistence on good food and healthy living, you might be surprised to learn that Feeding America lists Vermont’s food insecurity rate as 13.3% overall and a whopping 20.7% for children (based on 2009 figures). When battling hunger, there are choices to be made in how to approach the problem. Shall we give people food directly? Shall we help individuals to access resources so they can better feed themselves? Or shall we mobilize our communities to pull together to ensure that we all have access to the nutritious food we need? We visited an organization in Vermont that focuses on the latter two approaches -- Hunger Free Vermont, headquartered in South Burlington, VT. 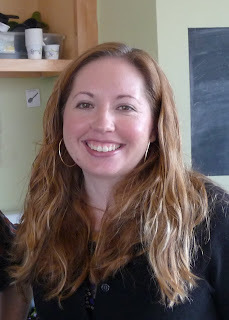 There we met Marissa Parisi, Executive Director. Marissa explained that Hunger Free Vermont began 19 years ago as the Vermont Campaign to End Childhood Hunger. It was a born out of the Vermont Food Bank when it became apparent that federal child nutrition programs were being underutilized in Vermont. When Marissa arrived 3 years ago, the organization was seeing a need to expand its mission, to include outreach to adults and seniors, and to update its brand. The organization held large community meetings (using a World Café method) and other research to shape the vision of what was needed. The new name, Hunger Free Vermont, was chosen to best reflect the expanded mission. So what does Hunger Free Vermont do? Here are some of the programs offered by the 16 employees of Hunger Free Vermont. For starters, Hunger Free Vermont works hard to get as many eligible people enrolled in 3SquaresVT (Vermont’s name for SNAP, the federal Supplemental Nutrition Assistance Program) as possible. In addition to outreach to families, Hunger Free Vermont has begun a specific 3SquaresVT outreach program for seniors. When older people struggle to feed themselves, it not only leads to poorer health, but also to increased isolation – they’re not likely to invite someone to visit if they can’t offer a cup of coffee, they’re not likely to attend a pot-luck meal if they can’t bring something, they may give up their Meals on Wheels deliveries if they can’t offer the suggested donation, and being able to offer special foods to grandchildren or other family members can strengthen family bonds. Nevertheless, many seniors have not taken advantage of 3SquaresVT – only about 30% of those eligible participate. And this isn’t just Vermont, it’s nationwide. Why? Marissa explained that seniors often remember what the old food stamps were like, how humiliating it was to stand in line to receive them and to count them out as payment for food. That stigma remains with them and they may not know about the easier EBT system in place today. Or, even easier, in Vermont (and only one other state, Nevada) seniors may receive their benefit as a direct cash deposit into their bank account, as opposed to a separate EBT card. This allows them more flexibility in how they use their benefit, such as continuing their Meals on Wheels delivery. Seniors may think that food assistance is a fixed allotment, so if they received the benefit, less would remain for children and families. They need to know that SNAP is an entitlement program, our country’s way of sharing, ensuring that we are all able to feed ourselves. Because seniors say they don’t want to hear about programs that benefit them from young people, Hunger Free Vermont, working with United Way, recruits volunteers over age 55 to visit senior housing and community meal sites, explain the 3SquaresVT program, and help with applications. On the other end of the age spectrum are child nutrition programs. Hunger Free Vermont dedicates 3 staff people to helping as many schools as possible participate in the federal school lunch and breakfast programs, summer feeding programs, and Child and Adult Care Food Programs (CACFP) We were particularly interested in learning more about CACFP because we had not previously had the opportunity to visit a childcare center using this program. Like school meals programs, CACFP is a federally-funded program, administered by states, whose goal is to enable children (and adults) to receive nutritious meals and snacks as part of the day care they receive. It provides centers with partial reimbursement for the meals they serve, based on the income of the participants. But CACFP is regarded by many day care centers as difficult to obtain and use due to the lengthy application and reporting process required. Such a process may be manageable by a school district, but onerous for a small day care center. To overcome this barrier, Hunger Free Vermont works with day care centers to find sponsors to take on the administrative burden of CACFP. The sponsor handles the 35-page application and the tricky reporting, freeing the centers to use a simple 6-page application and to focus on the meals. To see how it works, we paid a visit to the lunchroom at the Burlington Children’s Space, located at the McClure Multi-Generational Center, for which the sponsoring agency that holds the umbrella CACFP contract is Child Care Resource, a local child care information and referral agency. The meal reimbursement from CACFP makes it financially feasible for the Burlington Children’s Space to offer breakfast and lunch to their children. And the sponsorship makes using CACFP achievable for this small center. We spoke with Sarah Adams-Kollitz, Director, and Erinn Simon, the “Lunch Lady” at the Burlington Children's Space. Like most women we’ve met whose job is to feed children, Erinn is cheerful, dedicated, creative, and just loves making sure that children are well-fed. She says she tries to give each child a sense of food security. When the meal program was first introduced, some children from food insecure families might take more food than their share until they came to trust that there would always be enough food here for everyone. 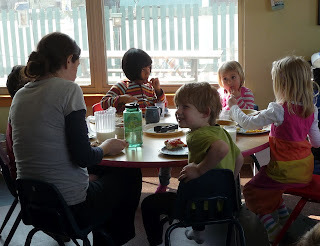 Teachers report that the children are calmer, too, now that they’re not worried about food. Lunch on the day we helped consisted of veggie burritos (soft taco, cheese, rice, mixed stir-fried broccoli, cabbage, and squash, all heated in the oven until the cheese melted, plus salsa for those who wanted it), corn, applesauce, and 1% milk. 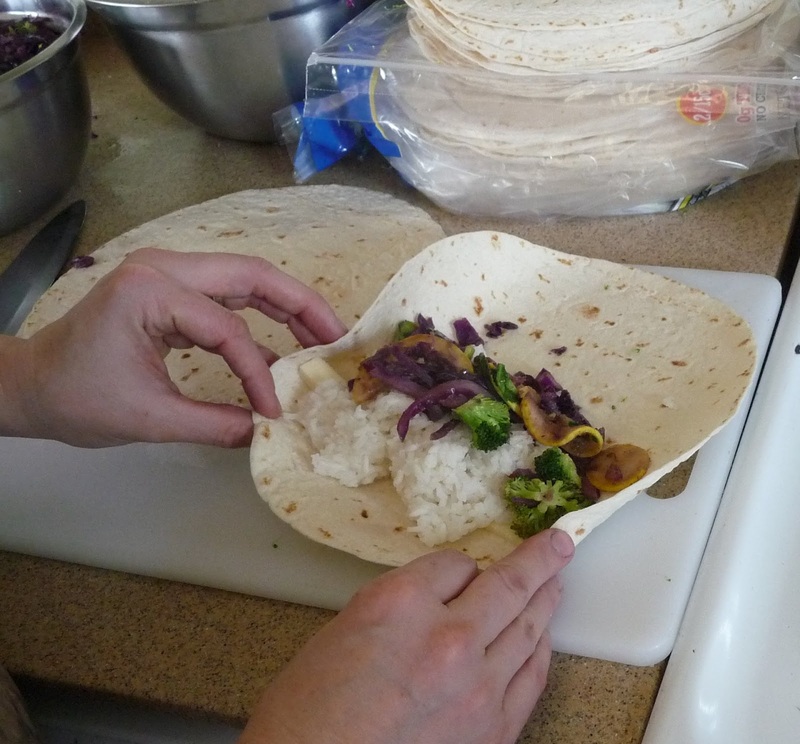 Erinn also adjusts the food she serves to accommodate any of the kids who may have dietary restrictions. Meals are served family style. The children sit 4 or 5 to a table, with a teacher, and help themselves to plates or bowls of food. It was great to see how comfortable the children were about eating together. We heard children politely asking for the applesauce to be passed and talking about how good the food tasted. We heard teachers informally describing the importance of eating different kinds of foods and stopping when you’re full. All the children seemed to take some of each food item and to eat most everything on their plates. Erinn gave a second half-burrito to anyone who requested it. 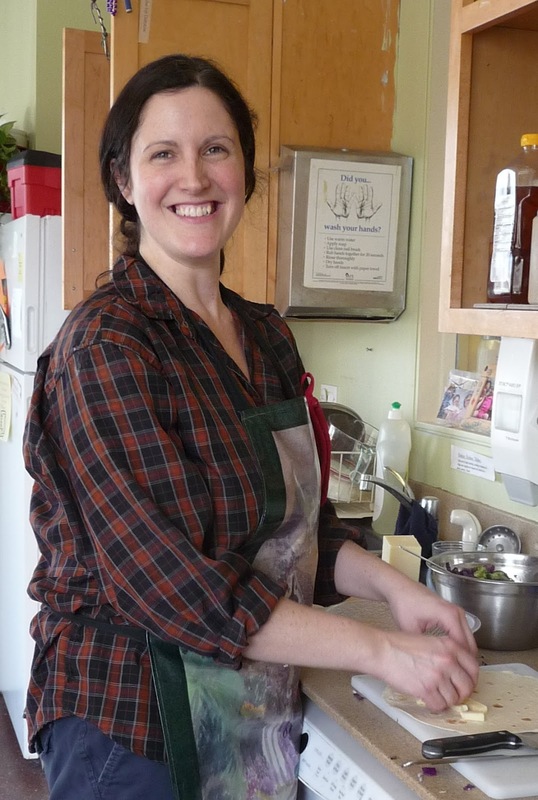 You can see more about Erinn on the Hunger Free Vermont site, where she and the Burlington Children’s Space were featured as one of Hunger Free Vermont’s “14Free” success stories. The list of Hunger Free Vermont programs goes on: They offer a 6-session cooking series called the Learning Kitchen, run a state-wide website called vermontfoodhelp.com/ that provides information on all the food resources available to families throughout the state. And they recently developed an on-line course called Childhood Hunger in Vermont: The Hidden Impacts on Health, Development & Wellbeing. This accredited course gives physicians and other health professionals the tools and information they need to both identify hunger and connect patients with nutrition resources. Hunger Free Vermont has expanded its community organizing and advocacy work by establishing regional hunger councils in areas that need additional anti-hunger services. Hunger Councils bring together influential leaders who are interested in eradicating hunger in their community. Currently, there are four councils, located in different parts of the state. 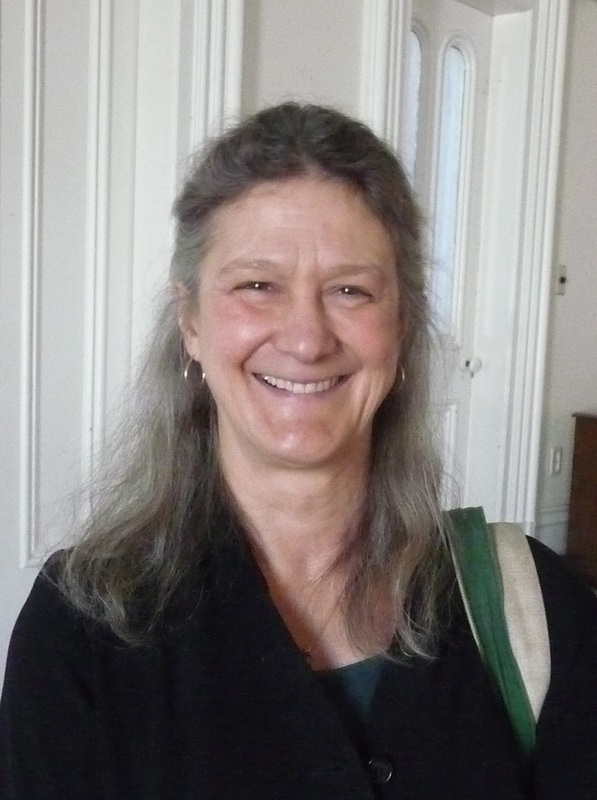 We were privileged to attend a quarterly meeting of the Hunger Council of Lamoille Valley at the invitation of Dorigen Keeney, Hunger Free Vermont Program Director. This hunger council is also supported by The Canaday Family Charitable Trust and the Green Mountain Fund. The meeting was held in a large meeting room at the First Congregational Church in Morrisville, VT. The approximately 20 attendees of the meeting included school superintendents and food service directors, as well as representatives from the Vermont food bank, area agencies for seniors, and Hunger Free Vermont. Chris Saunders, a field representative from Vermont Senator Leahy’s office, also attended. The meeting agenda included two main items. 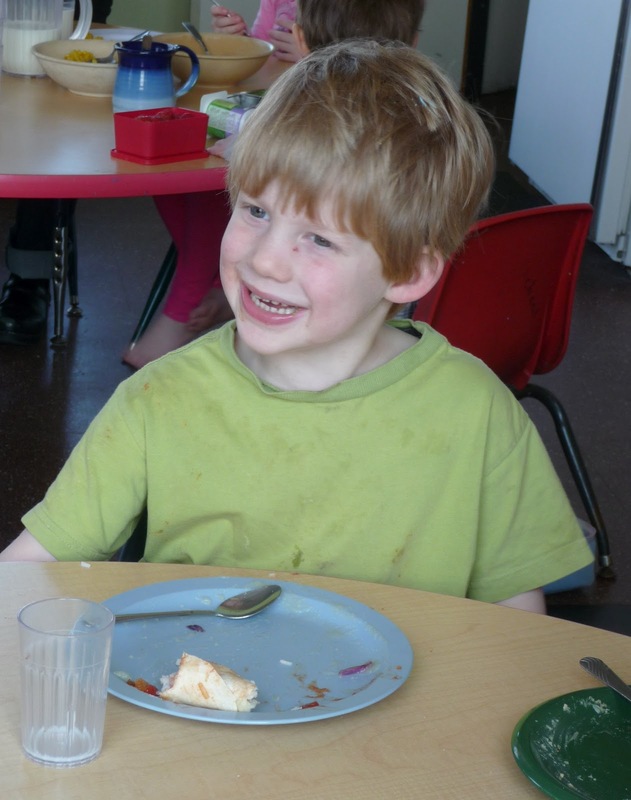 The first concerned summer food programs in Lamoille Valley. Amanda Caron, Child Nutrition Advocate from Hunger Free Vermont, described the importance of summer food programs for children. Some children are in tears on the last day of school because they know they won’t be getting school food over the summer. Also, summer often means difficulties with child care, so low-income children may be left at home alone, bored and isolated. Summer becomes a time of eating unhealthy food, weight gain, and loss of math and reading skills. Amanda described the federal summer food programs and said that of the 37,000 children in Vermont who are enrolled in free or reduced price meals during the school year, less than 15% have access to any summer food programs, and most of those are of brief duration. Establishing summer food programs takes creativity. It can be difficult to find sites equipped to prepare and serve meals near places children congregate, or associated with other enrichment activities. Transportation is a challenge when school buses aren’t running. And filling the summer with programs, rather than just a week or two, is also more than many summer programs can manage. Amanda then asked the group to share potential sites that could include summer food programs so that she could help them with the application process. The council discussed ways to get other groups, such as the Rotarians, involved. They also said that sites with kitchens could become sponsor sites to prepare summer food and deliver it to other sites. This could actually make money for the sponsor site. The second item on the Hunger Council agenda was the possibility of using schools as food centers, for example locating food pantries at schools or including seniors in school meal programs. There was an interesting comment that children during the summer and seniors often face similar issues of boredom and isolation. The meeting adjourned right on schedule, but many people lingered to continue their discussions. As we traveled home after our full day with Hunger Free Vermont, we talked about the progress that can be made by facilitating connections. Connecting people to the food benefits for which they are eligible enables them to live healthier lives. Connecting organizations to the food programs for which they are eligible enables them to provide healthy meals to hungry people. And connecting anti-hunger leaders with each other helps us all create healthier communities. Hunger Free Vermont overcomes any barriers it encounters -- misperceptions, lack of information, paperwork, confusing regulations, organizations working in isolation, programs not designed to meet Vermont’s needs -- and in the end finds ways to make all these connections work to end hunger in Vermont. All people deserve adequate and healthy food. Yet, even in the U.S., hunger is a serious problem. According to the USDA, at least 14.5% of Americans were food insecure during 2010. According to Feeding America, in some counties the rate is over 30%. Over 43 million Americans are on food assistance. Why? 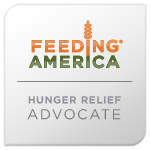 In response to the rise in hunger, "Facing Hunger in America" seeks to understand the programs that are in place to alleviate hunger in the U.S. We want to learn what works best, where the gaps are, and how concerned people and organizations can make an effective difference. We also hope to understand how government policy and the mainstream system of feeding Americans need to change to better prevent hunger and unhealthy eating. Postings in this blog are a small taste of what we're finding along the way. Comments welcome!